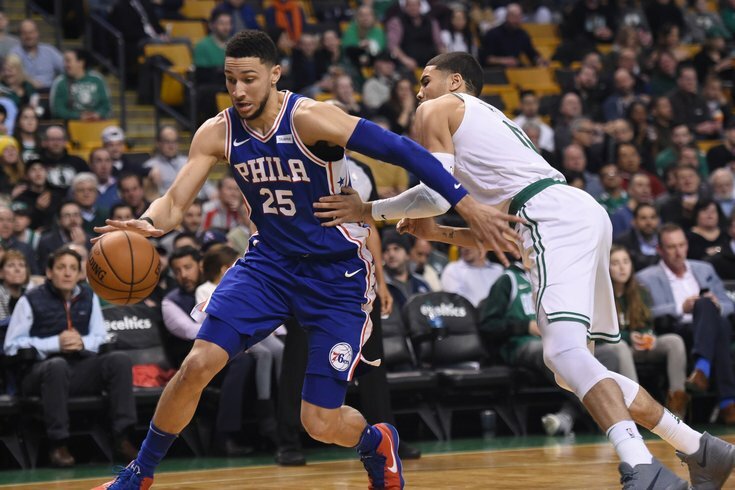 Philadelphia 76ers guard Ben Simmons dribbles the ball past Boston Celtics forward Jayson Tatum during the first half at TD Garden. Philadelphia's season may have ended a little sooner than fans hoped, but their individual players are still finding their way to the spotlight. Rookie guard/forward Ben Simmons has been named to the All-Rookie First Team for his performance during the 2017-18 season, joining Utah's Donovan Mitchell as the only unanimous selections for top rookie honors. Does 'Nova's Mikal Bridges do enough to justify being a top-10 pick? Mailbag: Who are some offseason trade targets beyond Kawhi Leonard? It's perfectly fitting for Simmons and Mitchell to stand alone at the top of the ballot, as the Rookie of the Year race will almost certainly come down to a battle between the two standouts. Boston's Jayson Tatum pulled in right behind them with appearances on 99/100 ballots, while Lakers swingman Kyle Kuzma (93/100 ballots) and Chicago's Lauri Markannen (76/100 ballots) rounded out the rest of the First Team. The only question now is whether Simmons or Mitchell will take home the top individual honors for the class. Philadelphia's top rookie should probably feel fortunate that ballots are submitted at the end of the regular season rather than the playoffs, because Simmons ended his first year in rather inglorious fashion. Boston exposed the degree to which his jump shot is a problem moving forward, while Mitchell went down swinging against an elite Houston Rockets team. Still, there's nothing for Simmons to hang his head about considering the year he had. With averages of 15.8 points, 8.1 rebounds, 8.2 assists and 1.7 steals per game — Simmons led all rookies in the final three categories — Simmons became the second rookie ever to average at least 15-8-8 over a full season, joining the great Oscar Robertson. He quickly rose up the Sixers' franchise list in triple-doubles for a career, and became just the fifth rookie in NBA history to put up a triple-double in a playoff game in a performance on April 21 against the Heat. Rounding out the second team was a group of productive, if less noteworthy names: Dennis Smith Jr., Lonzo Ball, John Collins, Bogdan Bogdanovic, and Josh Jackson. A name noticeably absent from the All-Rookie team voting: last year's No. 1 overall pick, Markelle Fultz. Stuck on the sidelines for the vast majority of his rookie season, the player Bryan Colangelo moved major assets to select was only able to offer brief flashes compared to his peers. No one would have realistically expected him to receive any love from awards voters — this isn't the time for participation trophies, after all — but it's a stark reminder of the stakes of the trade with Boston moving forward. All-Rookie teams are relatively meaningless in the grand scheme of things, and plenty of players who have been honored in the past have gone on to have inglorious careers. Two recent Sixers players can show you that best: Michael Carter-Williams and Jahlil Okafor were named to the All-Rookie First Team in 2014 and 2016 respectively, and Sixers fans aren't exactly pining to have them back in the fold. In any case, this is a nice honor for Simmons for the year he has had, and perhaps a bit of motivation for Philadelphia's other rookie to get to work this summer. Simmons and Fultz are two major pieces to Philadelphia's puzzle moving forward, and getting them on the same page and level should be a top organizational priority over the next couple seasons.